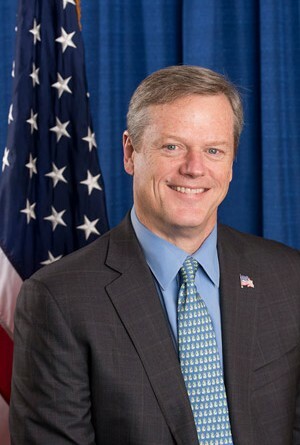 Massachusetts Governor Charlie Baker and Lieutenant Governor Karyn Polito joined public higher education leaders today, April 21, in Lowell to announce the Commonwealth Commitment, an innovative college affordability and completion plan to help more students achieve the dream of a college degree. The Commonwealth Commitment commits every public campus to providing 10 percent rebates at the end of each successfully completed semester to qualifying undergraduate students, in addition to the standard MassTransfer tuition waiver received upon entering a four-year institution from a Community College. Students who meet the program requirements will, depending on the transfer pathway they choose, be able to realize an average savings of $5,090 off the cost of a baccalaureate degree. This plan is the first agreement of its kind in the nation and was signed by University of Massachusetts President Marty Meehan, Worcester State University President Barry Maloney and Middlesex Community College President James Mabry, representing the three segments of the public higher education system, at a ceremony held this morning at Middlesex Community College. As part of the Commonwealth Commitment’s goal to increase cost savings and predictability, tuition and mandatory fees will be frozen for program participants as of the date they enter the program. Students will begin their studies at one of the state’s 15 community colleges, enrolling in one of 24 Commonwealth Commitment/ Mass Transfer Pathways programs that will roll out in fall 2016 (14 programs) and fall 2017 (10 additional programs). They must attend full-time, and must maintain a cumulative GPA of 3.0. After earning an associate’s degree in two and a half years or less, students will transfer to a state university or UMass campus to earn a baccalaureate degree. “The Commonwealth Commitment unites the Massachusetts public higher education sector in an energized drive to promote access and success for our diverse communities as we work together to build an educated workforce that will drive the Commonwealth’s high-tech community in the 21st Century. Community colleges are proud to play a pivotal role in this strategy,” said Middlesex Community College President Dr. James Mabry, in a press release. At the end of every successfully completed semester, students will earn a 10 percent rebate on tuition and fees, payable in the form of a check, or may opt to receive a voucher to use for books or other education-related expenses. The program does not discount room and board, although students may choose to use their Commonwealth Commitment savings or other resources to offset some of those costs. Students’ rebates or vouchers will be calculated based on the total cost of tuition and mandatory fees at the institutions they choose to attend. Additionally, students who enroll in free or reduced cost dual enrollment programs, taking college courses while still in high school, may be able to apply the credits they earn toward their Commonwealth Commitment degrees, thus reducing costs even further.